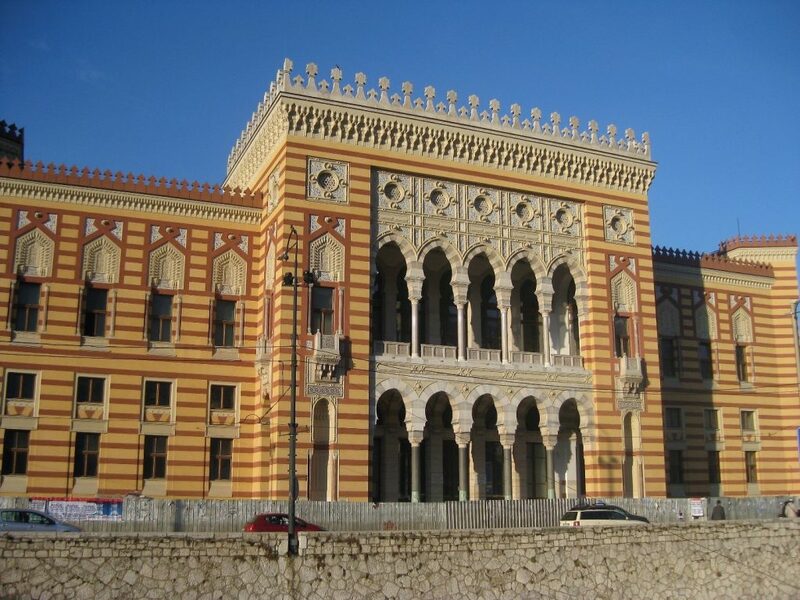 I arrived in Bosnia and Herzegovina excited to learn about its wealth of history. Sarajevo is famous for the 1914 assassination of Archduke Franz Ferdinand, but it also boasts historic mosques and beautiful churches, endless shops and market stalls, delicious food (palačinka for breakfast every day! ), and some striking architecture—like the striped and brightly colored City Hall. But after a couple days walking all over the city, we were ready for some hiking! 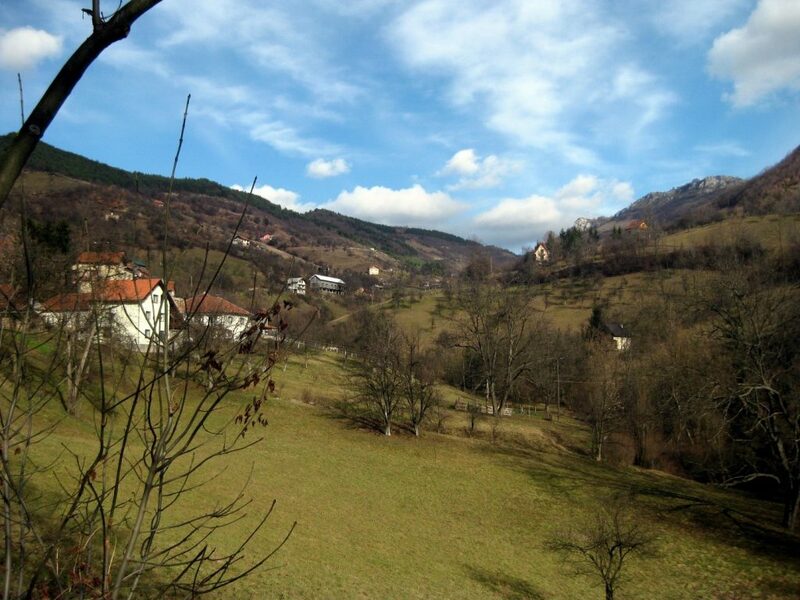 It’s worth spending extra time in the area so you can appreciate the incredible natural beauty surrounding Sarajevo. 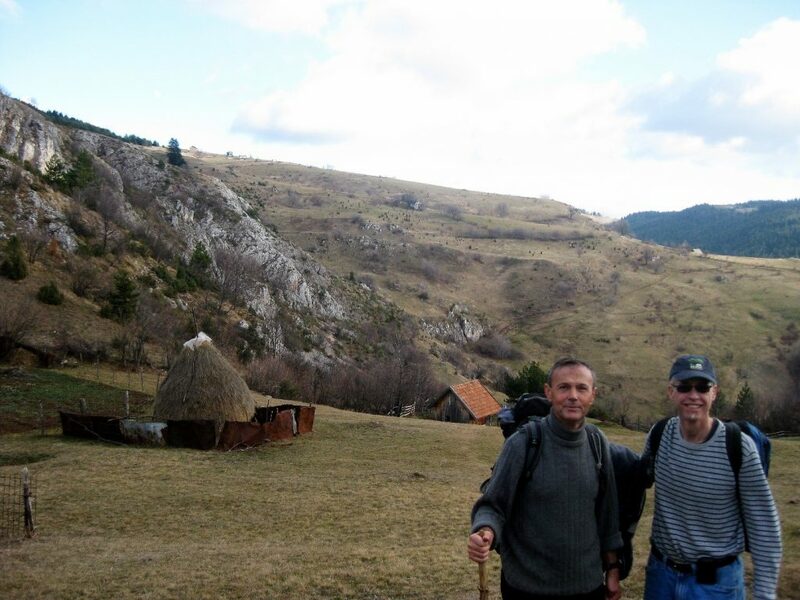 My dad and I love the outdoors, and we did not plan to miss out on hiking in Bosnia. We wanted to get far outside the city and find the best views without getting totally lost. Plus, there are still some landmines in Bosnia, relics of the Bosnian War in the 1990s. You won’t run into any as long as you stick to well-marked trails and roads, but that’s just the thing: we wanted to get off the beaten path. 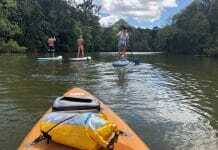 For us, hiring a knowledgeable local guide made the most sense. 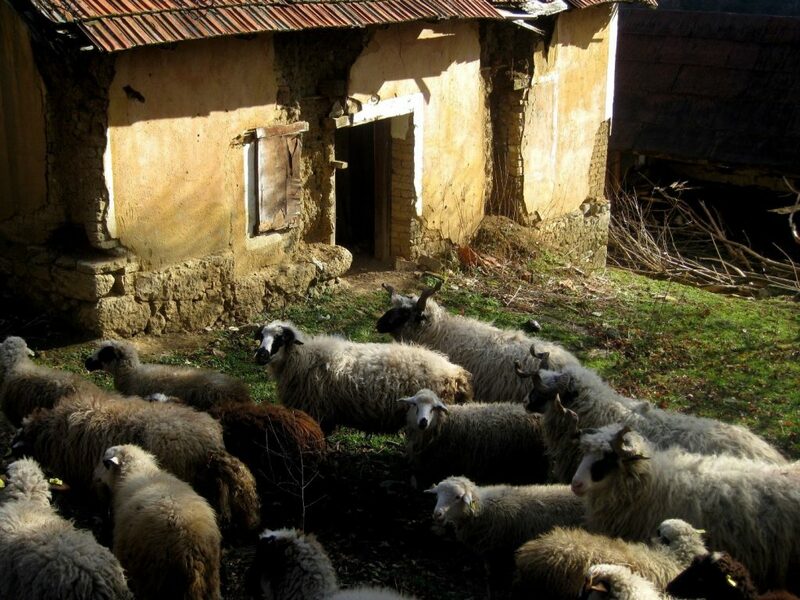 A family friend recommended mountain guide Fikret to us, and we got in touch. Best decision ever. He knows the mountains in Bosnia better than I know my own home. 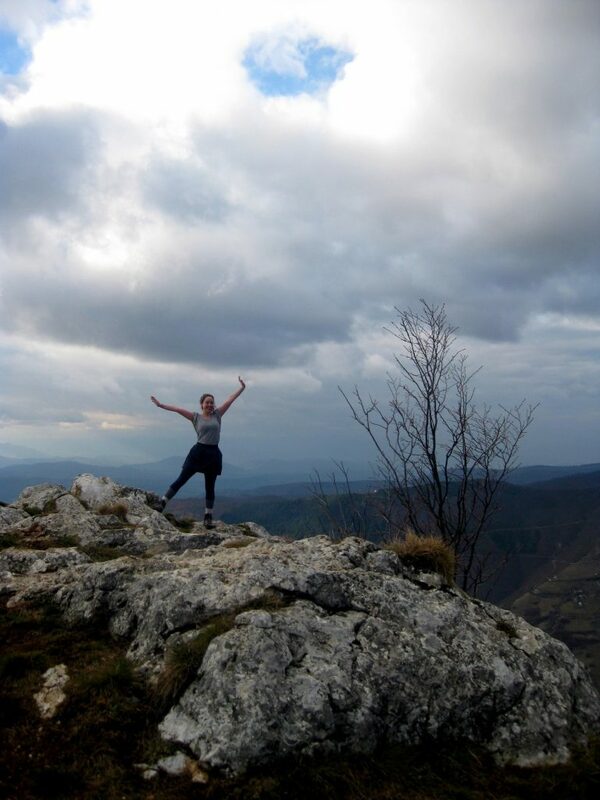 We can’t recommend enough finding a guide for a hiking tour of Bosnia. On our first hike, Fikret brought us up into the hills north of Sarajevo. It only takes a short drive outside the city until you feel that you’re in the middle of nature, surrounded only by rolling hills, trees, farmland and fields, haystacks, and the occasional cow. 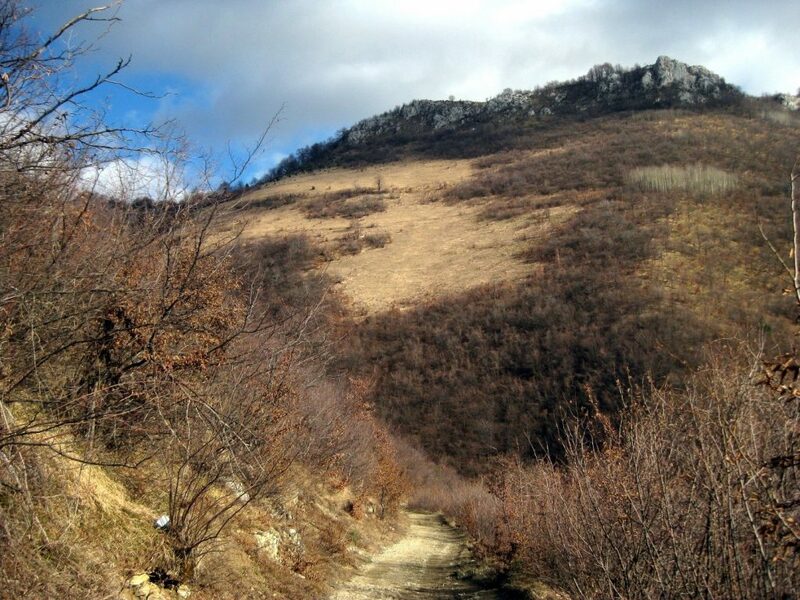 Even though we did this hike in January, Bosnia had had a warm winter that year. There was no snow on the ground, and the grass was even still green! Small farms dot the initial pathways up into the mountains. Along our hike, we passed cows, horses, a tiny donkey, and plenty of fluffy sheep. Many of the pastures slope steeply away from the roads and paths, but the animals don’t seem to mind. 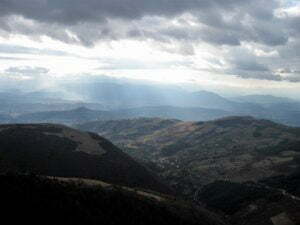 As we rose higher, we could almost catch a glimpse of Sarajevo in the distance. And on the south side of the city stands the Olympic-grade mountain Bjelasnica, popular with skiers. 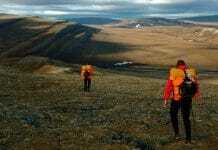 This is one of the trails, skirting alongside a hill and eventually bringing us up onto a ridge. Now that we’re up several hundred feet, the green grass has turned yellow and brown, and the hills are covered with leafless shrubs and short trees. During an entire afternoon of hiking, we ran into literally no one else. 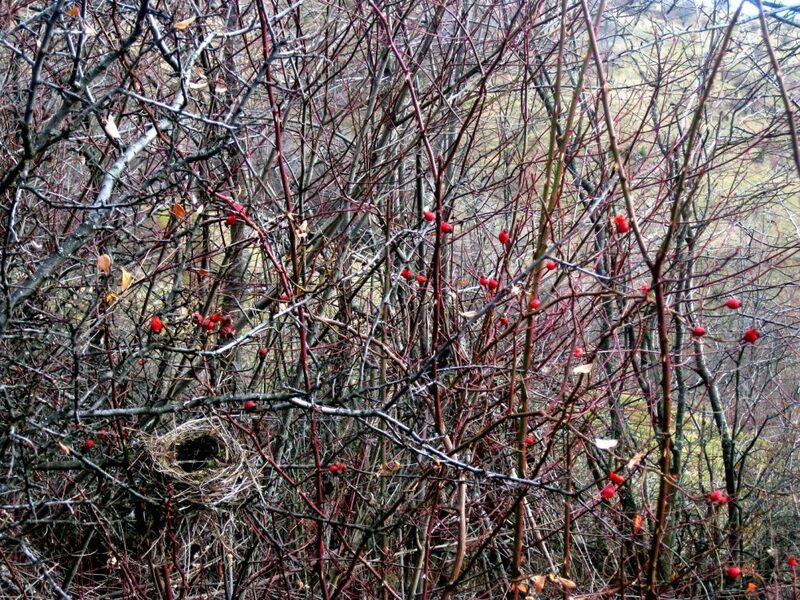 We walked at a steady clip but stopped to take in the scenery: in this case, bright red berries and a bird’s nest. 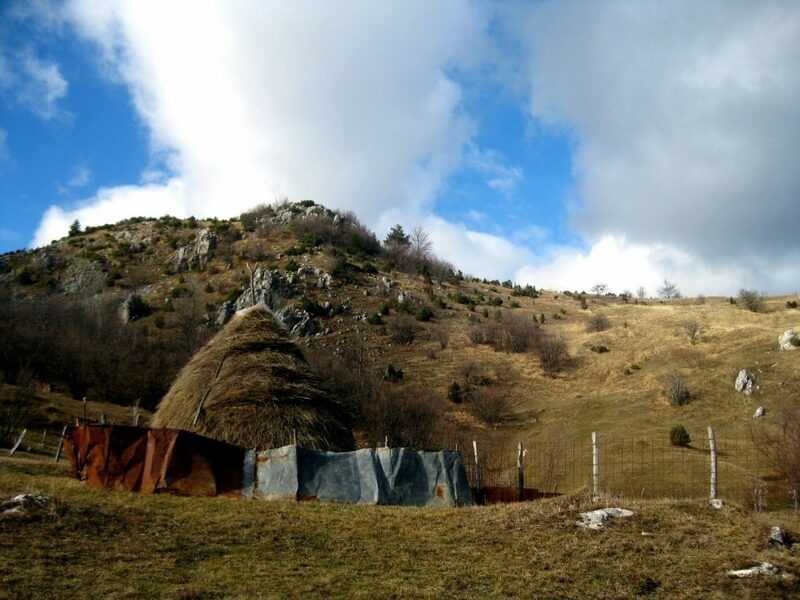 Even as we gained substantial elevation, there were still plentiful signs of human life: haystacks, fences, small homes, sheds, and farm buildings. Fikret and dad stop for a picture along our route. Made it to the top! Well, not “the top” exactly, but an excellent viewpoint nonetheless. 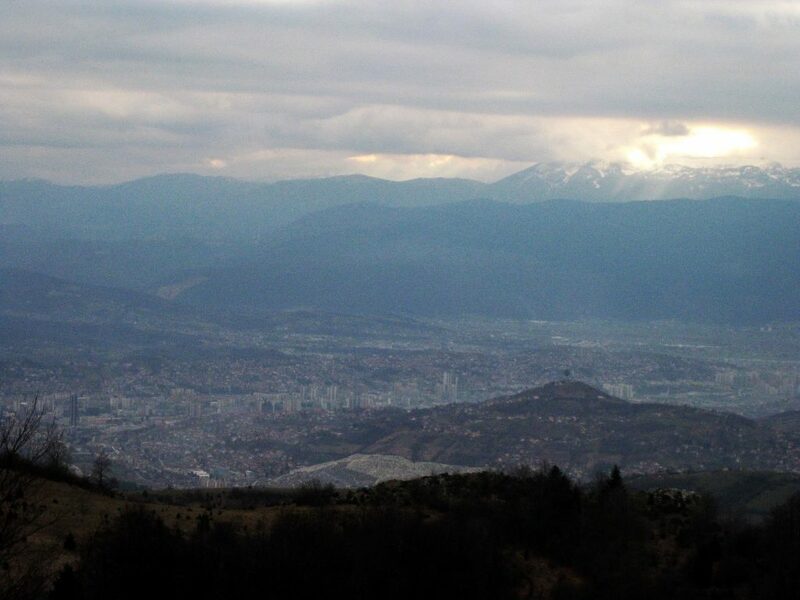 Sarajevo comes into view! 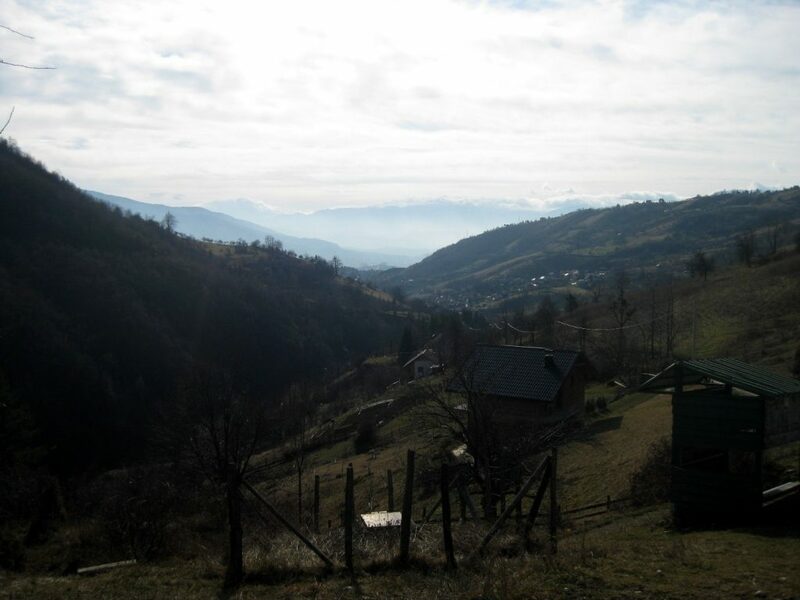 This city of around 400,000 people lies in a valley along the Miljacka River. 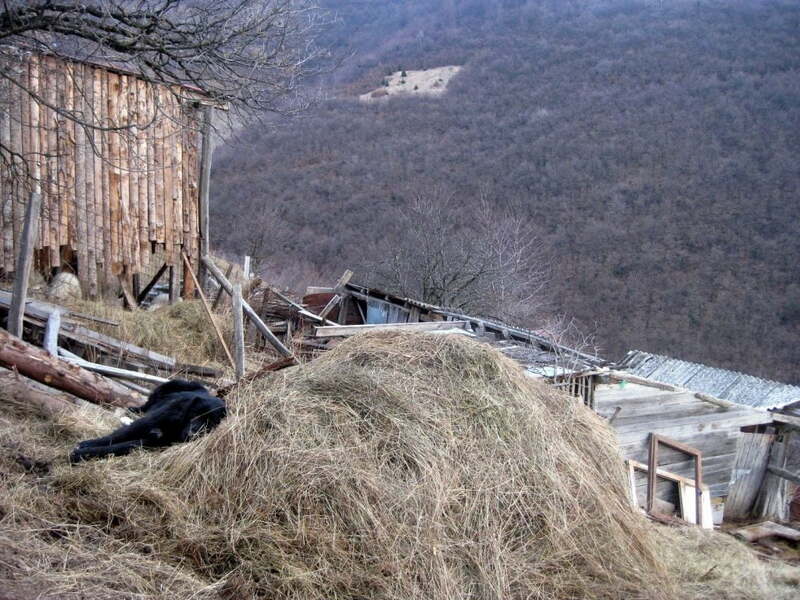 A dog takes a nap on a comfy haystack. We found plenty of friendly dogs on our way down. Pet any dogs you encounter at your own risk! I had recently had a series of post-exposure rabies shots and was still feeling pretty invincible, but my dad more wisely hung back. We finished off the hike with a well-earned cold beer and absolute certainty that we’d be back to hiking in Bosnia again! Awesome post! Love reading about people being able to explore an area that was ravaged by war. 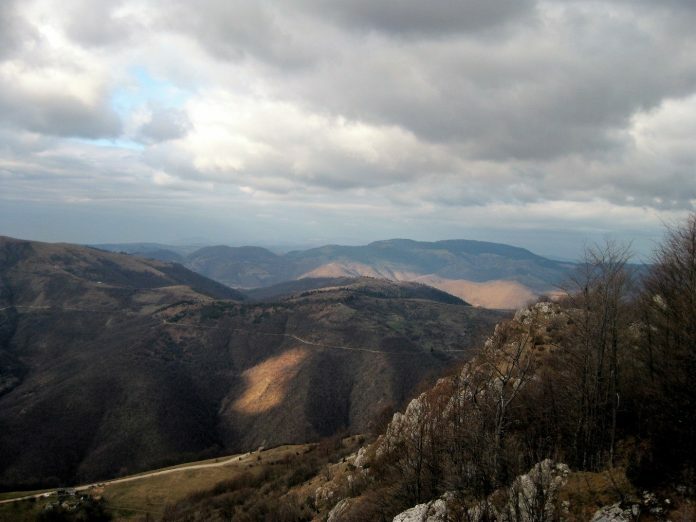 Great guide for those interested in Bosnia and safely exploring the surrounding areas. I hope you have a great time! So many amazing places to see in Bosnia–some of my favorites are Trebinje, Travnik, and Banja Luka (and of course Sarajevo and Mostar).